When the alarm went off at 4.30 am I groaned, it could not be 4.30 already! 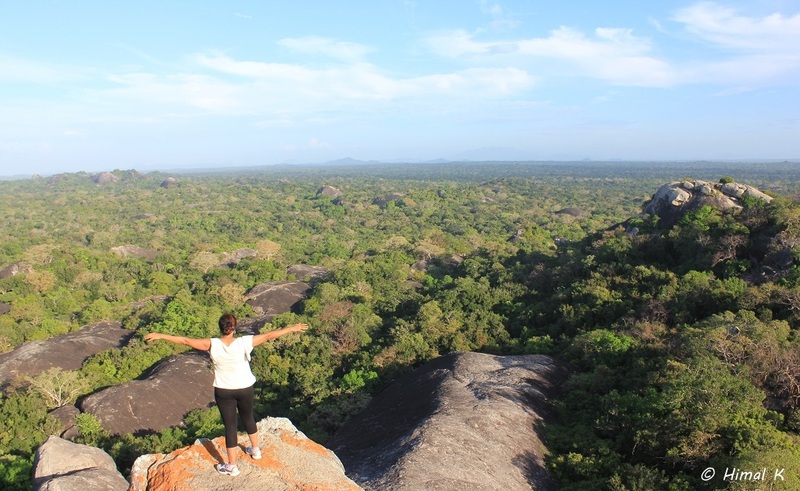 However as we were traveling in a group, I got up somehow and stumbled down on time to go to the Kudumbigala Monastery and Kumana National Park near Ampara in Eastern Sri Lanka. I am not a morning person. Given a choice I will never wake up early in the morning. I am grumpy to the core when I am out at an early hour. 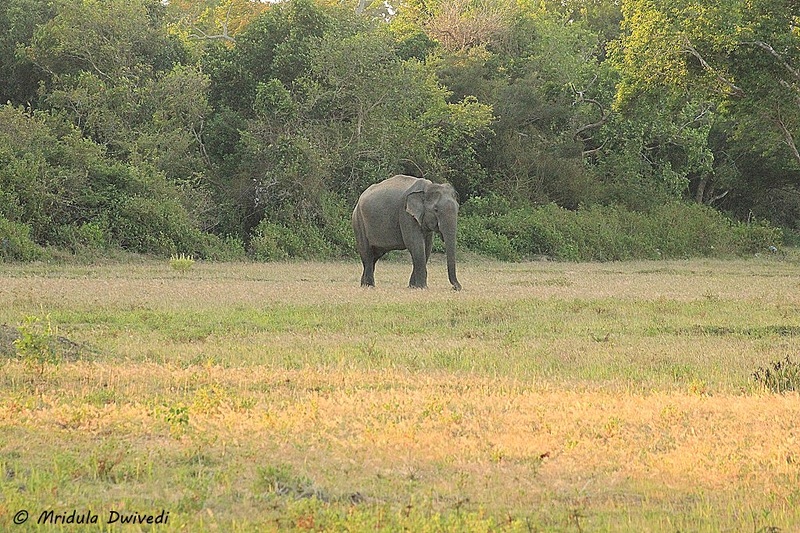 Even the elephant sighting right by the road at Kuamana National Park did not wake me up completely. That is When I Stopped Being Grumpy! But it was the view from the Kudumbigala Monastery hillock that did the trick, suddenly the day turned magical. I was no longer grumpy. It was worth getting out at 5.00 am just for this view. After returning from the small hike to the Kudumbigala Monastery we sat in our jeep in shade. A green bee eater gave us company. In the shade it was almost pleasant! As we had gone for the hike the day was getting hot. I was wondering about the sightings on our jeep safari. Wild animals do not like heat but there was no other way to fit in both, the monastery and the park, in the same morning. I love going to the jungle, I love the feel of the jungle. If I get to see big game I consider it a bonus. Otherwise I am happy birding. 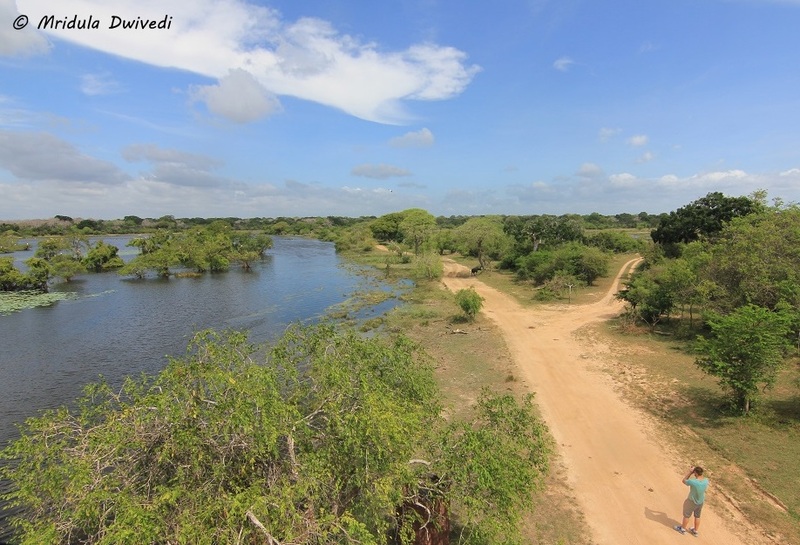 Kumana National Park has a large number of water bodies, which adds to its bird population and its charm. A Monitor Lizard Enjoys the Sun! As the day was getting hot, big game went hiding. However, there was plenty to enjoy if you love the jungle. 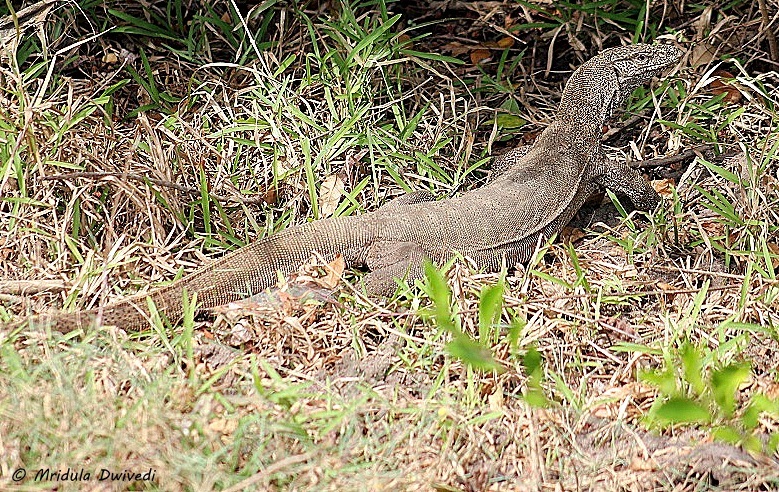 This monitor lizard was happily sitting in the sun, probably without a care in the world! 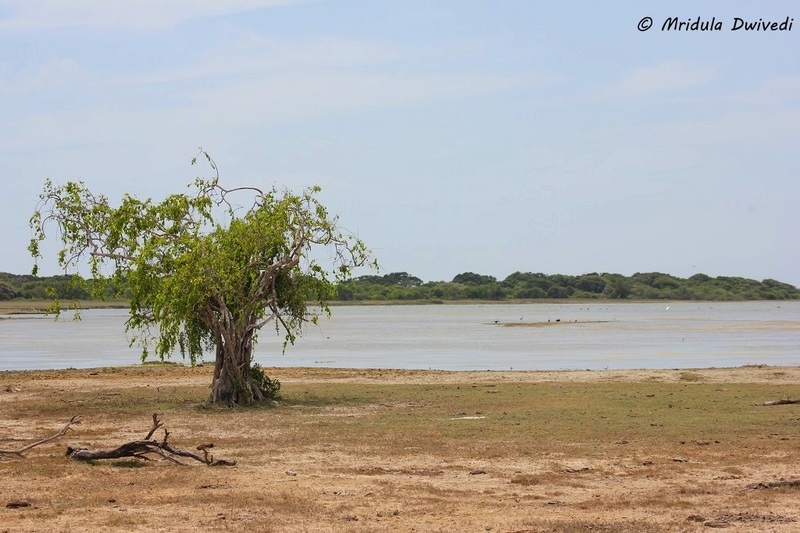 Kumana National Park is full of birds. I saw a lot more than I could capture and there were still more in the park which we couldn’t even see properly. I would see a flash of red or yellow but it would be gone before I could blink let alone ask my guide about it. The View from the Watch Tower! There is a watch tower within the park. It is a designated area where we could get out of our vehicles. By now a few of my group mates were dozing off, this break woke us all up! 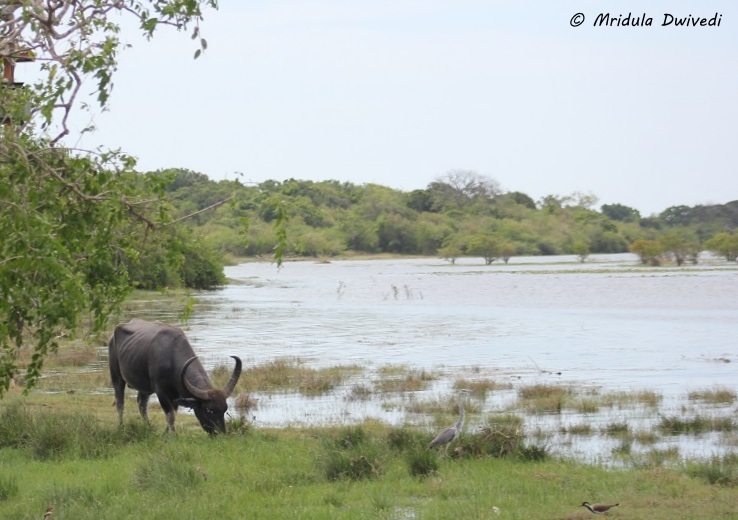 Kumana National Park has large herds of wild buffaloes. Their horns and whole demeanor looks scary. In spite of seeing so many, I wonder why took this picture of the one standing alone and it has come out the best too! A strange thing happened on this safari. 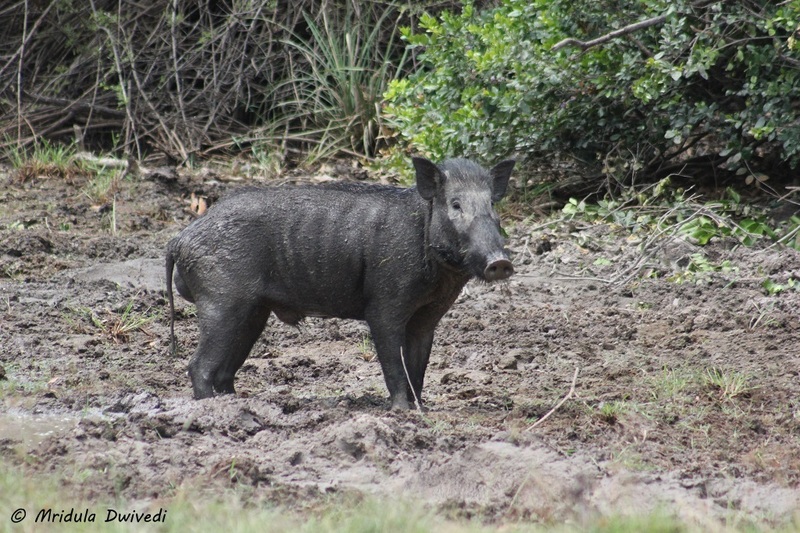 Because of the early morning start, all my group mates were fast asleep when a group of wild boars crossed our jeep. I have hardly ever seen anyone falling asleep on a jeep safari in a jungle before! 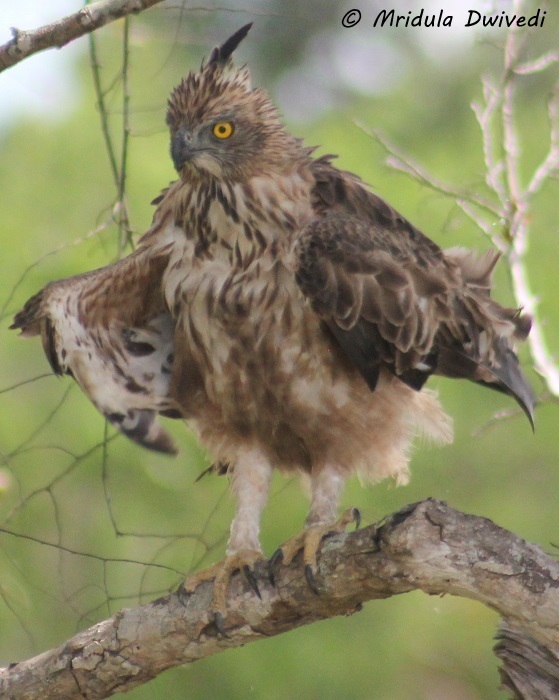 My group mates slept through the antics of the crested hawk eagle too! I guess the guys went to check out a beach party after dinner, whereas I crashed as soon as possible. I knew I would fall asleep later when we sat in the air-conditioned bus and headed to Batticaloa, our next stop! PS. I was invited by Cinnamon Hotels Sri Lanka on this trip. Lovely photos! I find it so challenging to shoot birds! Looks like a beautiful place. Maybe your teammates had taken an avomine or an equivalent to avoid motion sickness, because that sure makes me very sleepy when I take it! Awesome awesome pics Globetrotter! I am scared of these monitor lizards though. Thank you Shilpi, I am scared of them too but it is OK to see them from a jeep! Lovely place…. 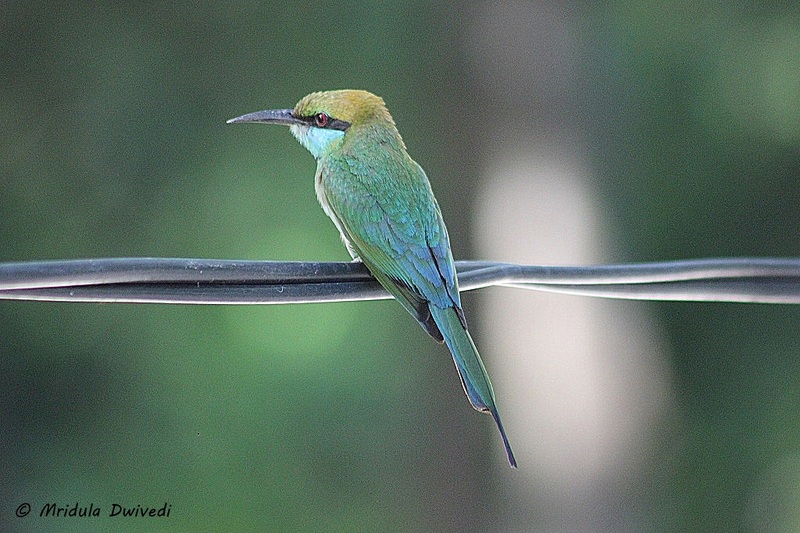 Green bee eater is beautiful….. 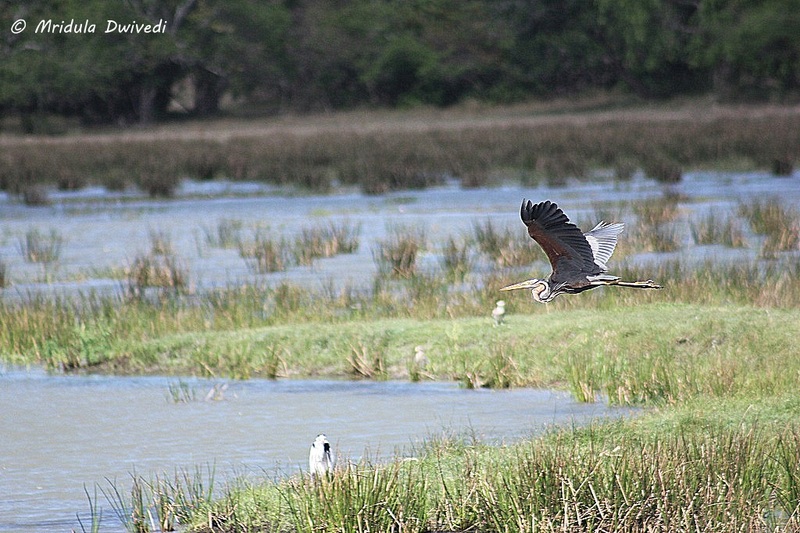 Thank you Sudhir, this bird was doubly wonderful because it was in no hurry to fly away! Its always wonderful and adventures to watch nature and wild creatures. Yes thank you Pankaj! I love going to the jungle! On my last to the Island country, I did stay in Cinnamon Hotel in Colombo. I did enjoy their hospitality. I enjoyed your post. Have made a mental note to visit there if there is the “next time”. I hope you will go back soon! 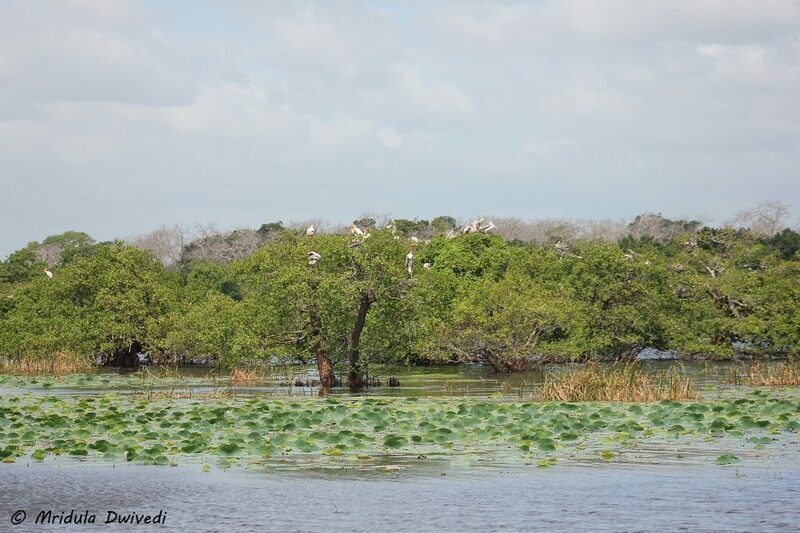 Sri Lanka is full of greenery and sea beauty .Thnx for sharing a beautiful post !! Thank you for stopping by Yogi! Nice sightings. Loved the beautiful frames. Beautiful narration Mridula. I just loved the picture of Gree Bee eater and they never shy away from the camera. Awesome post . Great pics. Thank you so much Emierre! 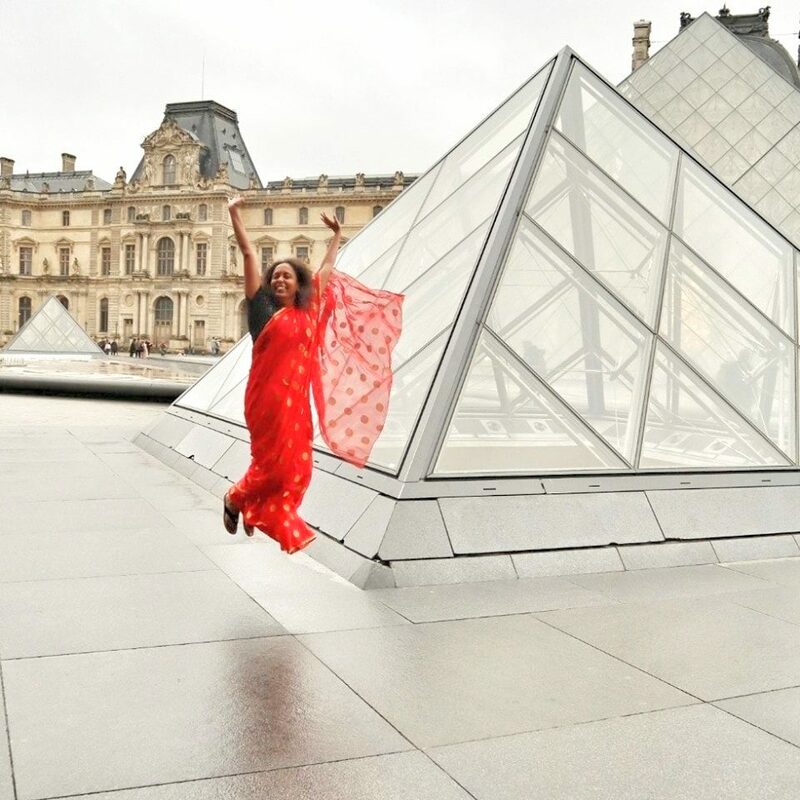 It is fun to see Portugal through your lens too! Beautiful snaps. Green Bee Eater & Crested Hawk Eagle are really pretty. Thank you so much Sumit.